We’d love your help. Let us know what’s wrong with this preview of Divine Magic by Doreen Virtue. You have natural magical abilities that can elevate your life to a whole new level, as well as heal and help your loved ones and clients. 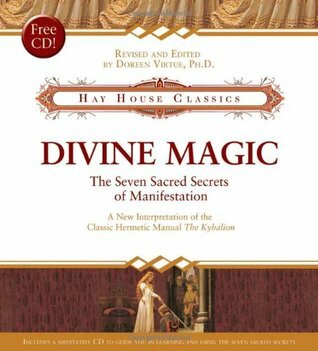 The original teacher of this Divine magic was an Egyptian sage named Hermes Trismegistus. His teachings, called “Hermetics,” were only taught verbally or in very cryptic writings. In 1908, three Hermetic students wrote these teachings in You have natural magical abilities that can elevate your life to a whole new level, as well as heal and help your loved ones and clients. The original teacher of this Divine magic was an Egyptian sage named Hermes Trismegistus. His teachings, called “Hermetics,” were only taught verbally or in very cryptic writings. In 1908, three Hermetic students wrote these teachings in a book called The Kybalion. Yet, this book was still difficult to understand because of its archaic and confusing language. 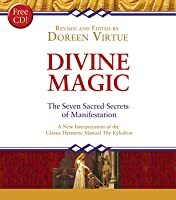 Now in Divine Magic, Doreen Virtue presents a clearly edited version of The Kybalion, written in understandable and modern language. She gives comments and practical suggestions based upon her own success in using Hermetic teachings for healing and manifestation. With Divine Magic, you can master your moods, release negativity, manifest new levels of abundance, and attract wonderful opportunities in all areas of your life. To ask other readers questions about Divine Magic, please sign up. This is in the grand tradition of The Secret. Positive thinking will make your life all better and you will have everything you want. I have a lot of problems with this sort of thinking and with some of the concepts in here. Two of the principles I have the most problems with are The Principle of Polarity and the Principle of Gender. Among other things these are basically dualism, while she explains polarity with some examples that are more circular than linear, I also have a problem with assign This is in the grand tradition of The Secret. Positive thinking will make your life all better and you will have everything you want. I have a lot of problems with this sort of thinking and with some of the concepts in here. Two of the principles I have the most problems with are The Principle of Polarity and the Principle of Gender. Among other things these are basically dualism, while she explains polarity with some examples that are more circular than linear, I also have a problem with assigning attributes to gender. Receptivity is no more feminine than action is male. Assigning the loaded words Positive to masculine and Negative to feminine isn't neutral, it's loaded and it gives inbuilt bias against feminine, no matter how you try to load it differently. I have a lot of issues with all of this and it is part of the endemic attempts to pigeonhole gender and apparently ignore the variations of humanity and highlights such things as "all women" loving pink, heels, etc. Along with "all men" loving sports, DIY etc. These dualities are damaging and ignore the fact that everyone is different and that everyone should be able to like what they want and be the best themselves they can be. The book also equates monetary wealth with success, and while monetary wealth can make living in our current paradigm quite good, it's not always a source of happiness for people. A pretty interesting look at the laws of the Universe and how to work with them, rather than against them. I've seen some other reviews of this book which complain about this law of attraction stuff being rubbish. If you think it's rubbish, why are you reading books about it? This book is quite obviously about how to use the laws of the universe along with changing your own thoughts to make changes in your life. If that's not your thing, go read something else. I actually really liked this book. A pretty interesting look at the laws of the Universe and how to work with them, rather than against them. I actually really liked this book. There is a lot more in here than just 'think happy thoughts', which some similar books are. 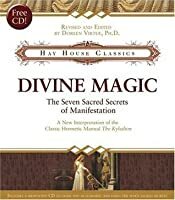 Anyway, if you are into the law of attraction, Hermetics, want to know more about the Kybalion, or are into creating and manifesting awesome things in your life it's definitely worth a read! Read for school. Honestly I don't have an opinion one way or another. The topics/laws were fascinating to read/learn about, but didn't completely resonate with me. I can see how some might value this though. Majority of this book is excerpts from the actual Kybalion and I didn't find her interpretations to add a lot of additional insight or value. The concepts of Kybalion deserves 5 stars and I recommend you to pick up a copy. A very inciteful book. One that has to be read atleast twice to understand how to utilize the methods of Hermetics. An open mind is needed and a willingness to utilize the visualization part of the mind. After that, it is pure magic and delightful occurences happen making the proven methods true over and over again. It is book which requires patience and practice of using the hermetic system, however, once it is learned and practice, you'll wonder how you ever lived without it. Doreen has used her wisdom and writing skills to make the Hermetic information understandable to any layperson. I consistently refer back to the book and gain new understanding each time I re-read specific sections. Her lever chart for polarity is especially helpful in changing attitudes quickly. Highly recommend! 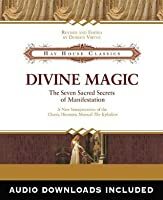 Gives an easy-to-understand overview of 7 Hermetic principles that we can apply to our daily living. Will help you gain insight & perspective into ways you can better your life, by raising your thoughts to a higher, positive level. Also comes with a free cd you can listen to with the same info. I usually like Doreen Virtue, but this one was a little too "deep" and abstract. By the time I read this I had read quite a bit of Doreen Virtue books and I was getting overly saturated with the same message delivered in only slighly varying ways. Very informative, I'm going to read it again. Very good book and really does get your mind working differently. Highly effective and useful. Definitely a must to read. Really deep book. Intriguing, interesting. An excelent mentalism powerbook. The cd that comes with this books is great. Inspiring book that can help us mortals understand the flow of energy to manifest what we want. Overall, I think it was a good read. She did a decent job of taking a more complex and sometimes confusing text and making it concise and much easier to follow and comprehend. This was a quick simple book that put into perspective who we are and how we interact with our mental functioning universe to master our lives. Doreen Virtue is a fourth-generation metaphysician and clairvoyant doctor of psychology. Doreen is the author of numerous best-selling books and products, including Assertiveness for Earth Angels, and Healing With the Angels book and cards. She's been featured on Oprah, CNN, Good Morning America, and in newspapers and magazines worldwide including her weekly column in Woman's World magazine called Doreen Virtue is a fourth-generation metaphysician and clairvoyant doctor of psychology. Doreen is the author of numerous best-selling books and products, including Assertiveness for Earth Angels, and Healing With the Angels book and cards. She's been featured on Oprah, CNN, Good Morning America, and in newspapers and magazines worldwide including her weekly column in Woman's World magazine called "My Guardian Angel."